I like collecting. And the objects I like having around aren't just decorative, but ones that are potentially useful, just like the items I make and sell. In particular I like little cups, and have many odd ones scattered around my home: cups to hold things like buttons, salt and — of course — beverages. 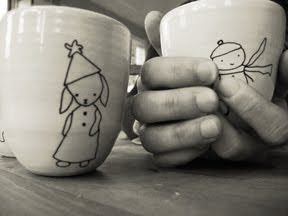 A few years ago I introduced small, handmade tea cups to the Kata Golda collection. 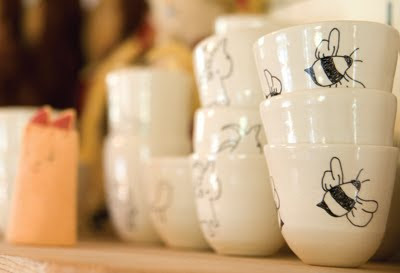 They are stoneware cups, decorated with my illustrations and glazed in soft white. 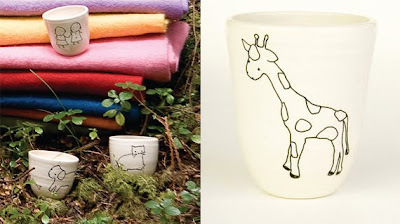 When we made the cups for my 2010-2011 collection I wanted them to be more useful, so we made them bigger. Now that they can hold 5 ounces, they are actually large enough for a coffee, juice, hot chocolate or wine. They feel nice to hold, fitting neatly into my hands. I look at stacks of these completed cups every day when I am in my studio. It didn't take long for some additional uses for them came to mind, and I decided to experiment. 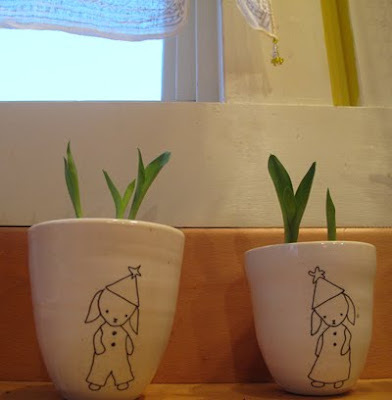 This winter I planted paper whites in my Kata Golda tea cups — but not with dirt. I filled the interior of each cup with marbles and securely nestled a bulb in each one with a top layer of marbles, being careful not to bury it. I then filled the cups with water, making sure that the bottom of the bulb was in the water. They have done quite well near my eastern-facing windows in my warm kitchen, and smell wonderful. Another use I found for my cups was as a votive to hold a candle. 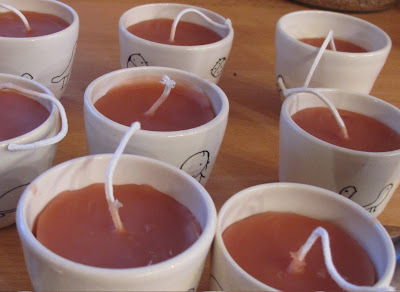 You could place a small pre-made candle in the cup, but I prefer to make my own beeswax candles, pouring them directly into the cup. First I melted the beeswax in a large aluminum juice can placed in a double boiler. Then I scooped out the hot wax into each cup, leave some room at the top. 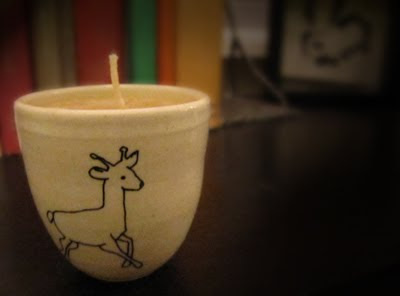 I dipped the wick into the hot wax to make it stiff (and easier to work with), and when the wax in the cup became a little more solid, I pushed the wick into the middle of the candle until it hit the interior base of the cup. I like the idea that the use of these cups is always temporary and they will soon be used for something else. Warm beverages, candle light and fragrant flowers all make these dark winter months a time to savor. Kata Golda is available for custom and commissioned pieces large and small, and will gladly teach workshops for children and adults. Call or email for details.